Careful minutes and notes are recorded in this complaint letter against collection agencies who breach the Data Protection Act. 1. I was phoned by a Mr. Aaron Jackson at 21:17, which is outside of the normal business calling hours listed on the guidelines. 2. Representatives named Ms. Karen Smith and Mr. Jon Doe came to my residence at 123 Main St. although I specifically withdrew the common law rights for solicitors to visit my property without my permission. 3. 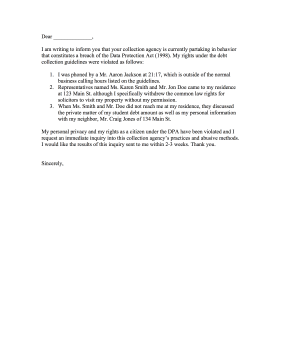 When Ms. Smith and Mr. Doe did not reach me at my residence, they discussed the private matter of my student debt amount as well as my personal information with my neighbor, Mr. Craig Jones of 134 Main St.
My personal privacy and my rights as a citizen under the DPA have been violated and I request an immediate inquiry into this collection agency's practices and abusive methods. I would like the results of this inquiry sent to me within 2-3 weeks. Thank you.